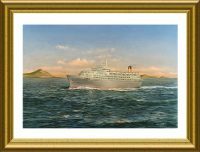 Not so many years ago the freighters and liners of the Matson line were a regular sight around the American ports and across the South Pacific. Sailing aboard one of their great ocean liners was a lifetime experience of luxury, excitement, adventure and memories. 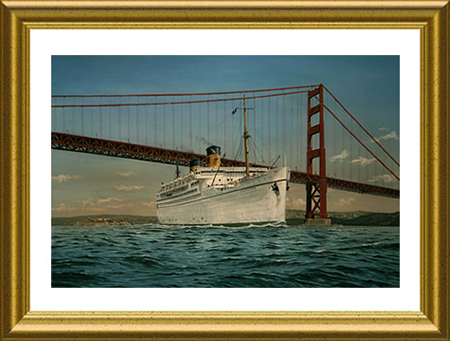 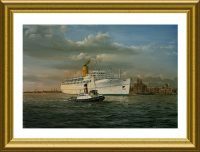 We asked Robert for a painting that would capture and symbolise the magnificence of those great ships, which is exactly what he’s managed to achieve in this impressive painting of the Lurline as she passes beneath the Golden Gate bridge on her way to Hawaii… what a magnificent sight she makes. 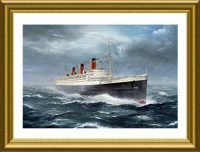 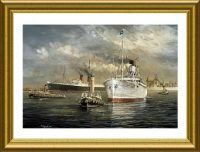 The size of this painting, framed in antique guilt is 33″ X 25″ inches and is featured on the front cover of Episode 29 in the Great Liners series, “The Matson Line“.